And during the six busiest months of the year, from April to October, other signs tell that it will cost ten dollars to stay one hour. These signs are not put up because Mr. Burbank is cross or rude, but because these strange new plants have to be watched as carefully as tiny babies. He can't leave them for visitors. 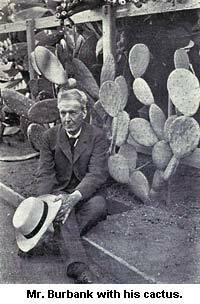 Luther Burbank was born in Lancaster, Massachusetts. When he was a baby in his cradle, his mother and sisters found that nothing made him dimple and crow with delight like a flower. They noticed, too, that he never crushed a flower, and once, when a petal fell off a flower he was holding, he tried for hours with his tiny fingers to put it back in place. And when he was big enough to run about the house and yard, instead of carrying a toy or a dog or cat in his arms, he was usually hugging a potted plant of some kind, for as people saw his great love for such things, they were on the lookout for cunning plants for the dear little Burbank boy. One day Luther was trudging across the yard, clasping a small lobster-cactus in an earthen pot, when he stumbled and fell, breaking the pot and plant. He cried for days over the accident. At school, Luther was a delight to his teachers. There were few black marks against his name. He liked all his lessons, but the books that told him about birds, trees, and flowers pleased him most. When Luther was old enough to go to Leicester Academy, he had for his dearest chum a boy cousin who knew Agassiz, and who through him became interested in science. This boy wanted to study about rocks and caves, rivers and fish, while Luther watched the birds that perched on the rocks and the trees that grew near the rivers. But the two spent many weeks tramping over the country together. Luther worked several summers in a factory near his home. He was quick to understand machinery and invented a machine that saved the manager of the factory a great deal of money, for it would do the work of six men. Luther's family and friends were sure he would be an inventor. But he himself wanted to raise flowers. Luther saved a little money and started a vegetable garden. He tried experiments with the potato plants until he raised an entirely different kind than had ever grown before. Of course this made him want to experiment with other plants, and he stayed in the hot sun so much looking after them that he had a bad sunstroke. This led to his going to a climate where he might live outdoors during more months of the year, and where he would not be apt to have such attacks. When Luther reached California, he had only a few dollars, rather poor health, and was among strangers. He tried to get work on farms or orchards, because he wanted to experiment with vines and vegetables. But if he got work, it was usually for only a few days at a time. Finally he was obliged to work on a chicken ranch, where the only place for him to sleep was in one of the chicken coops. The pay was small, and he did not have as much or as good food as some pet dogs get. But all the time he was saying to himself: "If I can have patience, I shall yet get a farm of my own." By and by he was hired to look after a small nursery (this is what a big plantation of trees is called). He would have been perfectly happy there if sleeping in a damp room had not given him a fever. He was poor, sick, and almost alone, but not quite, for a very poor woman, who had only the milk of one cow to sell, found him one day lying on a bed of straw, and ever after that insisted on his drinking a pint of her milk each day. He declared that this milk saved his life. For some years Luther took one odd job after another until he saved enough to buy a small piece of ground. Then he was soon raising plants and making new varieties. He read and studied and tried experiments. Sometimes he failed, and even when he succeeded there was a good deal of fun made of him. Some people thought Luther Burbank was crazy. It seemed such an odd thing for a man to think of doing--making a fruit or a flower that had not been heard of or dreamed of before! But he did not pay any heed to all this sneering. He worked harder than ever. And before long, the first new plants were in great demand, so that by selling them he got money to buy more land. To-day some of the largest orchards in California are growing from one of Luther Burbank's experiments. And our country is millions of dollars richer from his new kinds of plums, potatoes, and prunes. Mr. Burbank bought acres of land, hired armies of workmen, denied himself pleasures and visitors, and did not mind how tired he was, so long as old plants were being made better, or new plants were being created. Pretty soon letters began to come from Russia, France, Japan, England, South America, and Africa, asking for some Burbank plants and some Burbank advice as to their care. Mr. Burbank has made more new forms of plant life than any other man. He has worked on two thousand, five hundred species of plants. Besides making flowers more beautiful and of sweeter fragrance, he has done wonders with the cactus plants that grow on prairies. Once all these plants were covered with thorns and prickles, so that the cattle who bit into them rushed away with bleeding mouths, feeling much the same as we should if we put our teeth into a stalk of celery and bit on to fish-hooks and needles. Well, Mr. Burbank has changed all that. The fruit of some of his cactus plants is almost as sweet as oranges; the thorns are all gone so that the stalks are fine food for cattle; some of the leaves make good pickles or greens; and the small plants are used for hedges. So the plants that were in old times a pest and nuisance are to-day, thanks to Mr. Burbank, a comfort to the world. Luther Burbank is a handsome, courteous gentleman, fond of fun, of young people and children, but you can see how busy he has been in the odd science of making new plants and trees, and as he has plans for a great many more, you will also understand why he really has to have those signs put up around his farm at Santa Rosa.